During the evening of the 23rd of May 1970 the bridge was greatly damaged when boys looking for bats inside the bridge accidently dropped a burning torch, setting alight the tar-coated wooden roof of the tubes. The bridge's height, construction and the lack of an adequate water supply meant they were unable to control the fire. After the fire had burned out the bridge was still standing but the structural integrity of the iron tubes had been critically compromised by the intense heat. As a consequence the bridge was completely rebuilt. The new design was for an arched bridge. 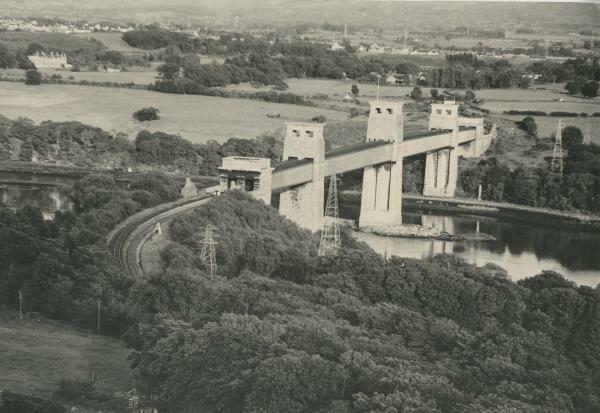 Concrete supports were built under the approach spans and steel archways constructed under the long spans either side of the central Britannia Tower. The bridge re-opened to rail on the 30th of January 1972. The bridge was decorated by four large lions sculpted in limestone by John Thomas, two at either end. The lions cannot be seen from the A55, although they can be seen from trains on the North Wales Coast Line below. The idea of raising them to road level has been suggested from time to time. In 1980, almost 10 years after the fire, the upper road level opened, carrying a single-carriageway section of the A55 road.